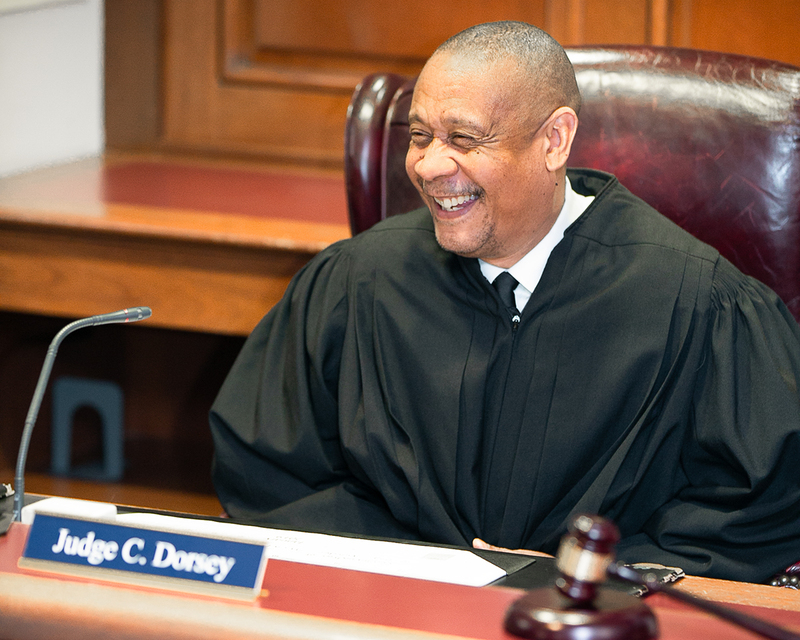 THE HONORABLE CHARLES H. “CHIP” DORSEY, III, is an associate judge for the Circuit Court for Baltimore City. For 16 years he has served as a member of the MSBA Committee on Lawyer Assistance, which provides oversight of the Lawyer Assistance Program (LAP), of which Dorsey himself is a former client. MSBA: How did you first become involved with LAP? CHD: I was a LAP client approximately 18 years ago. I had issues dealing with stress and anxiety in a healthy way, and the Lawyer Assistance Program was there to help me. Professionally, I have served on the Lawyer Assistance Committee for the last 16 years. I mentor students, other judges, or lawyer who may have stress, anxiety, alcohol/drug/depression issues. MSBA: Did your experience getting help from LAP make you want to become involved in the Committee? CHD: [Former LAP Director] Richard Vincent drafted me. He told me that I was going to give back what was given to me, so he kind of nudged me. It’s been a very rewarding way of giving back. I never thought I’d be giving back in this arena, but it’s been very rewarding for me to help the program in any way possible. We used to call that “volun-told”. MSBA: Why use the Lawyer Assistance Program, rather than going through a private healthcare provider? CHD: Lawyers are usually Type-A personalities – very hard to help. Starting in law school, we are brought up in an adversarial environment, which is very stressful and really antisocial. We’re taught to be very defensive, argumentative. A lawyer is wired differently from other individuals, so it is probably easier for another lawyer or a judge to identify the denial issues and understand the defense mechanisms that somebody may use when addressing their issues. The Lawyer Assistance Program was set up directly for lawyer. Doctors are wired differently than other individuals, so the program is set up to be able to break down defense mechanisms that we use to deny that we have an issue. MSBA: Some people are under the impression that the program is only for substance abuse. CHD: My use of the program was for substance abuse, so I was challenged in the beginning because I felt as if it wasn’t confidential, that there were people who were going to try to take away my law license; a lot of attorneys are concerned about what the ramifications from utilizing LAP might be. So it was very hard for me to accept the help [at first]. But the Lawyer Assistance Program has evolved into a more holistic approach to deal with mental health issues – depression, stress, anxiety – management or relationship problems, financial issues. Today, we deal with the whole individual. We deal with attorneys probably better than any other entity because attorneys feel as though, if they get help, it’s not going to be confidential, that everyone will know their issues, that the Attorney Grievance Commission may become involved, or that there may be repercussions at work because they seek assistance. But LAP is a totally confidential program based on helping the individual, and all of their information remains confidential. MSBA: What if a law firm or legal organization wanted to learn more, collectively, about LAP and the services it provides? Is there any way they can approach the Committee? CHD: Sure. We have an outreach committee that reaches out to any community within the legal profession. We visit law schools and address ethics classes. We go to the Public Defender’s Office and do conferences. We go to the State’s Attorney’s Offices and provide lectures on what LAP has to offer. Contact LAP Director Jim Quinn or Program Counselor Lisa Caplan. MSBA: You mentioned speaking to law students. Have you noticed any sort of evolution in those audiences’ awareness or understanding of these issues over the years? CHD: I graduated from the University of Baltimore School of Law in 1988, and no one at that time came to the law school to say, “Look, this is an adversarial system that causes stress and anxiety, so if you experience stress or anxiety, or you have a drug problem or depression, come to the Lawyer Assistance Program.” It was more of a reactive program. Today, LAP is a proactive program. We reach out to law students and explain to them some of the symptoms that they may experience later in their careers, or which they may be going through right now. I’d say at least half of our clients are law students. Maybe they’re feeling the stress of getting used to an adversarial system, which is very stressful. It may be that they’re getting ready to take the bar exam, and they’re feeling more stressed. It may be that they don’t know how they’re going to pay back their student loans after they’ve graduated from law school. Maybe it’s just helping people to juggle a home life, and taking care of themselves. These students have really embraced the program. Most of the students that come forward are those suffering from anxiety, those suffering from depression, and they feel relieved that it’s not seen as a weakness but just a part of being a human being. They see it as a tool they can use throughout their entire career. We’re there because we want them to be barred, we want them to remain barred, and we want them to have a life worth living. We’re also backed by the Judiciary. Chief Judge Mary Ellen Barbera of the Court of Appeals is a big advocate of the Lawyer Assistance Program. We’ve reached out to judge and lawyers and law firms. And President Keith Truffer has Lawyer Assistance one of his major initiatives, that we no longer want to be silent. We no longer want to be reactive. We want to be proactive and to let you know that these resources are available for anyone in our legal community. MSBA: Please tell us about LAP’s wellness workshops. CHD: Our wellness workshops take a holistic approach to the whole lawyer or law student and their families, as well. Other members of the Committee, through Lisa Caplan, who is a licensed social worker, put together programs to teach individuals how to care for themselves – how to physically care for themselves, how to mentally and emotionally care for themselves. Again, it is a very stressful, adversarial occupation when we take on the brokenness of society. We think that for us to be able to take on that brokenness of society you have to have healthy tools to deal with the stress and anxiety that clients or society may bring upon you. Or maybe just balancing a family life, or financial stress, or caring for a parent who’s getting up there in age, getting divorced, and so on. Instead of waiting for an individual to break down, we become proactive, and give you a new toolbox to deal with stress and anxiety in healthy ways. Because if you don’t deal with stress and anxiety in a healthy way, stress and anxiety will find an unhealthy way to deal with you. We aren’t machines. Many people don’t know this, but the Maryland Lawyers Assistance Program was the first lawyer assistance program in the country. Maryland has always been progressive. It started off by Richard Vincent basically being reactive to individuals who had DWIs, or hear through some other third party that they may have an alcohol abuse problem. And then we realized that we were missing a vast majority of the issues that lawyers and law students had, and we evolved into a more holistic program where we deal with anything from bipolar depression and dementia to financial issues, relationship problems, stress from taking the bar exam. We wanted them to know that if you need to see a therapist, if you need to go to treatment, if you need someone to sit down and give you tools to deal with stress and anxiety in a healthy way, that they have a confident, competent, professional resource available to you. Previously, money and location limited the ability to use these services, because you had to come to Baltimore. The big change now is that because it’s become such a priority, you don’t have to come to Baltimore to receive services. If you’re in Western Maryland, we’ll get you counseling in Western Maryland. If you’re in St. Mary’s County, we will get you counseling in St. Mary’s County. If you need counseling on the Lower Eastern Shore, or Cecil County, you don’t have to come to Baltimore City to receive services. And money isn’t an issue. It’s more important to us that you get the services than be limited because you don’t have the money to receive those services.